Native advertising is a form of advertising that integrates high-quality content into organic experience of each given platform. Native ad units conform to the design and feel of the sites on which they are displayed, preserving the user-experience while producing click-through rates similar to that of editorial content. We understand the effect of ‘banner blindness’ on your campaign. That’s why native advertising introduces sponsored stories within the content your audience is already consuming. Successful native ad campaigns build interest and engagement with readers through compelling content. Our data segmentation and persona creation techniques help us identify your audience segments and develop brand messages that speak to their interests. We, at MPlan, work to increase the reach of your content marketing efforts by sharing articles, publishing stories and growing the conversation. 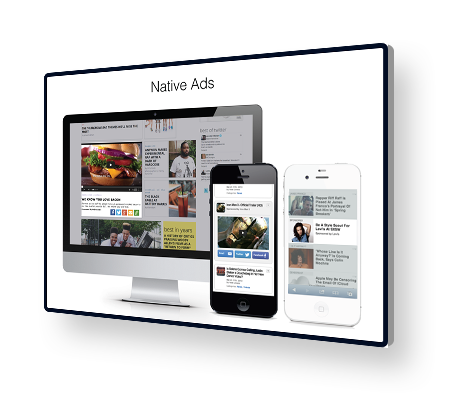 Native ad content engages the target audience and grows brand awareness. Native advertising showcases the brand to wider audiences across multiple online communities and platforms.